Good Night, Knight is a procedurally generated dungeon crawler with a large item pool, a humorous story, and a 16-bit "cutesy" artstyle. The game starts with a Knight (the player) falling out of a spire. After landing at the base of said spire, the player must climb it while fighting enemies on every floor, meeting NPCs, solving puzzles and using the resources available to them to upgrade a Knight. As a whole, gameplay is defined by the top down perspective, stealth elements, and a limited field of view. Enemy types are numerous containing humans and monsters alike. Iron Man mode was introduced in Solid Alpha 1 for players that want an extra challenge. 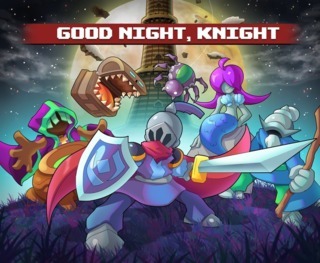 "Good Night, Knight" was created in 2015 by KnightDev as a hobby project he would come back from time to time. Seeing promise in the project, KnightDev created RedEmber as a studio to publish the game online. The first release of the game was a pre-alpha released May 31. 2018. The pre-alpha was released to backers of "Good Night, Knight"'s patreon.com page as well as the first "Solid Alpha" build being released to patreon backers on February 19. 2019. Subsequent releases are expected to be released the same way, with KnightDev wanting the full game on Steam. In 2018 Joe Hanna and Chaotrope joined development with Hanna doing freelance art and Chaotrope creating the sound track for the game.